Alfred Brooke was born in Dewsbury, Yorkshire on 3 February 1857 and baptised at All Saints Church there on 2 November. He was the son of George Brooke, a solicitor’s managing clerk, and Hannah Hutton. Alfred came down to Oxford with his parents in about 1860. At the time of the 1881 census, when he was 23, he was a clerk to the gas company and living with his widowed mother at Great Clarendon Street. Agnes Castle was born at 16 Observatory Street, Oxford near the beginning of 1861, the daughter of Joseph Castle, an engineer at Oxford University Press, and Martha Savoury, who had worked as a servant in Oxford. At the time of the 1861 census Agnes, who was just one month old, was with her parents and four surviving siblings at 16 Observatory Street. She was baptised on 28 April at St Paul’s Church, as although Observatory Street was in St Giles’s parish, it was in the district chapelry of St Paul. In 1868 Agnes’s father took out the first lease on 3 Bevington Road, which he named Brynrhos, and Agnes (10) was living at home there at the time of the 1871 census. By 1881 she was living at Manor Farm, Itchin Abbas, Hampshire, where she was a governess to the children of George Way (50), a widower and farmer of 420 acres. Leila Brooke (born at 26 Warnborough Road in 1900 and baptised at Ss Philip & James Church on 7 December). By the time of the 1891 census Alfred Brooke was Chief Clerk to the Oxford Gas Company and lived at 39 Queen Street with his wife Agnes and their first three children Alfred (6), Dorothy (4), and Muriel (2), plus a servant. By 1893 they had moved to Park Town. † Muriel Agnes Brooke died at 4 The Terrace, Park Town at the age of 5 on 13 June 1893 and was buried at St Sepulchre’s Cemetery on 15 June (burial recorded in the parish register of St Giles’s and Ss Philip & James’s Church). Her baby sister died just nine days later at Wolvercote. Her maternal uncle Joseph Castle was the manager of the paper mill there, and it is possible that she was taken to stay with him at Mill House in the hope of avoiding infection. 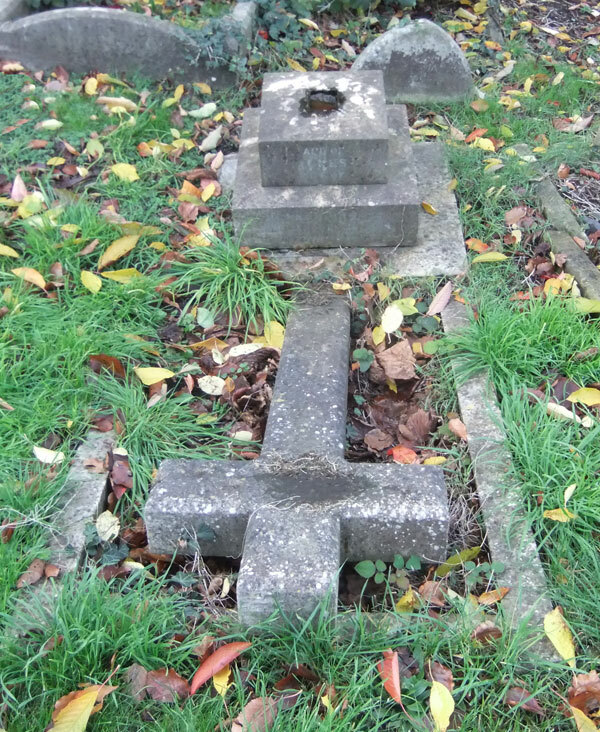 † Mildred Margaret Brooke died at Lower Wolvercote at the age of thirteen months on 22 June 1893 and was buried at St Sepulchre’s Cemetery on 23 June (burial recorded in the parish register of St Giles’s and Ss Philip & James’s Church). From 1895 Alfred Brooke is described as an accountant rather than a clerk. By 1901 the family had moved to 26 Warnborough Road, and their family was complete. In 1911 Alfred and Agnes Brooke were home at 26 Warnborough Road with five of their children: Alfred Walter (26), who was a civil servant; Dorothy Ethel (24), who was a teacher; and Gerald (15), Lionel (12), and Leila (11), who were at school. They had one servant. Two children were away from home: Vera (19) was a student of physical training boarding in Ormskirk, Lancashire; and Cecil (17) was a bank clerk, boarding in Leicester. Their son Gerald attended the City of Oxford Boys' High School in George Street from April 1905 to March 1912: his older brothers Alred and Cecil and younger brother Lionel were also at that school. He became a bank clerk, and appears to have emigrated to Canada between 1911 and 1915. 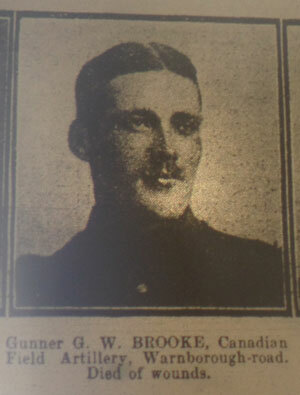 He volunteered to serve in the war, and enlisted on 25 March 1915 from the Union Bank, Saskatchewan in the 18th Battery of the 5th Field Artillery Brigade. He gave his date of birth as 8 August 1891 rather than 1895. 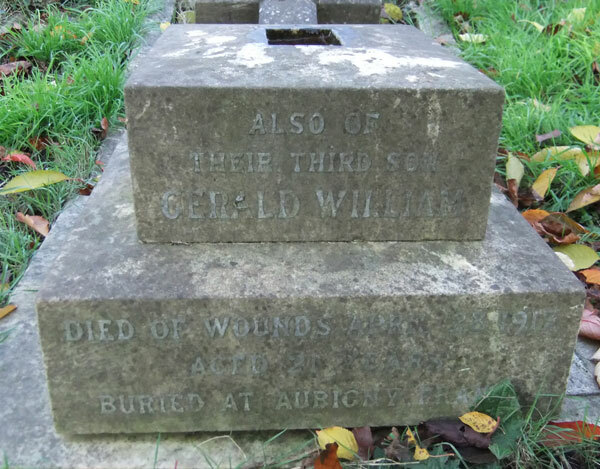 † Alfred Brooke died at Warnborough Road at the age of 67 on 20 September 1924 and was buried at St Sepulchre’s Cemetery on 27 September (burial recorded in the parish register of St Giles’s Church, and probably also that of Ss Philip & James’s). His effects came to £2,134 0s 11d. Alfred Walter Brooke (born 1884) is hard to trace, and does not appear to have got married. He may be the man of that name who died on 31 July 1963 at Saffron Walden, Essex. Dorothy Ethel Brooke (born 1886) married Cyril William Hurcomb (later Lord Hurcomb), the son of William & Sarah Ann Hurcomb, on 14 August 1911 at St Luke’s Church, Chelsea. Their daughter Pamela Hurcomb was born in Kensington in 1915. Vera Mary Brooke (born 1891) may have married Jack Ray in London in 1916; in which case she is probably the Vera M. Ray who died at Eastbourne at the age of 69 in 1960. Cecil Bernard Brooke (born 1893) may have married May O. Heller in Elham in 1915. He died in Surrey at the age of 74 in 1968. Leila Brooke (born 1900) was living or staying at Davenant Road, presumably with her uncles, when on 9 June 1928 she married the shipping clerk Alwyn Rigby Hughes at Wolvercote Church. The marriage was announced in The Times, and their new address was given as 26 Lathom Road, Southport. Leila died at Oldham at the age of 58 in 1958.